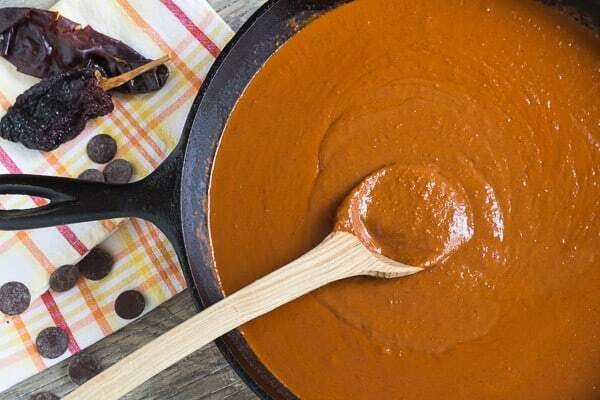 Homemade chile chocolate mole is a lively balance of sweet and savory elements–dark earthy chiles and roasted nuts, aromatic spice, and the famous pinch of chocolate–a traditional mole (mo-lay), made simpler. 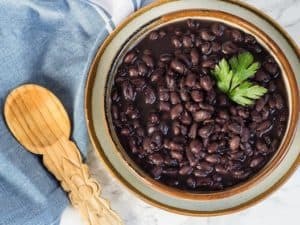 This is a rich, totally approachable mole recipe made with healthy ingredients that you can put together in a little over an hour! When we gringos talk of mole, we most often have in mind a spicy red brick colored mole with chocolate. There are many other Mexican cooked sauces known as mole, with diverse colors and ingredients. 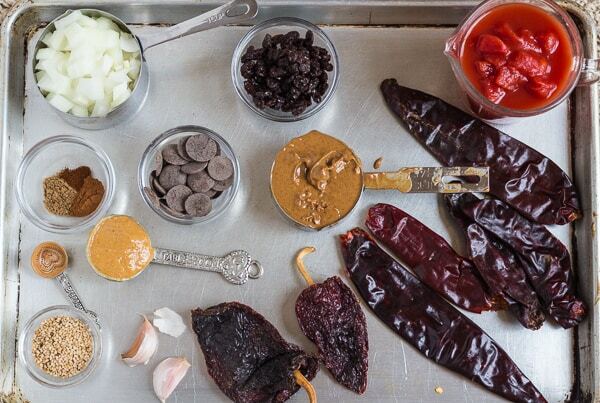 This homemade chile chocolate mole is a mole poblano. Basic ingredients for mole poblano don’t vary all that much, but they differ in ratios and technique, from household to household, each cook having her own secret ingredients. I researched 4 cookbooks before coming up with this healthier, less labor-intensive mole poblano. 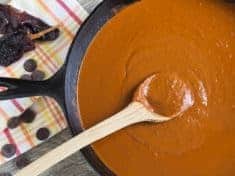 Like in authentic Mexican red enchilada sauce, dried whole chiles are essential to this homemade chile chocolate mole. 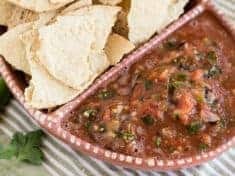 Dried chiles are easy to prep–you warm the chiles in a skillet, cut off the top stems (I use scissors), dump out the seeds, and then soak the chiles in boiling water. They soften while you prepare everything else. 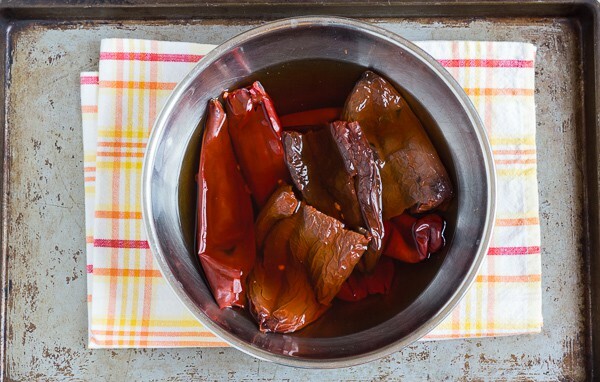 Use a mix of dried chiles, both raisin-y ancho chiles and the easy to come by guajillo chiles, sometimes called pasillas. If you can find dried mulato chiles, include them for their mild, faintly chocolate taste. Look for whole dried chiles in the Latino ingredient aisle in grocery stores or Latino markets. Read more about dried chiles here. Truth out: In days gone by, my mole came from purchased mole paste that you thin with broth. The trouble came when I read the label on the jar, and saw that prepared mole contains wheat, sugar, funky oil or lard, and preservatives. Nix that. chiles and chocolate. Once you have your mole, make a hot dish–stacked mole enchiladas with arugula, potatoes, and carrots. 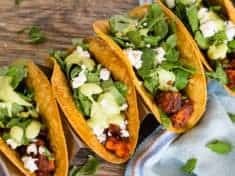 Cookbooks with mole recipes: Diana Kennedy’s From My Mexican Kitchen, Ruth Reichl’s Gourmet Today, Anna Thomas’ The New Vegetarian Epicure, and a slim paperback I’ve had forever, Ortho Books Adventures in Mexican Cooking. The idea to add apple juice comes from the mole poblano in The New Vegetarian Epicure. This mole may be made in advance and freezes well. Divide into 2 cup containers to use when you want, with roasted or grilled vegetables, like potatoes or green beans. Mole poblano makes a delicious taco and enchilada sauce too. 5 guajillo chiles , or 3 guajillo and 2 mulato. Wash the chiles. 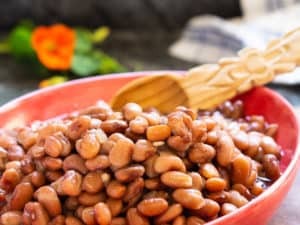 If you wish, warm them in a cast iron pan until soft. Cut off the stems. Tap the chiles upside so the majority of the seeds fall out. Discard the seeds. Place the chiles in a bowl and cover with the boiling water. Weigh them down with a small plate to keep them submerged. Let soak while you prepare the other ingredients. Heat the first tablespoon of oil in a large skillet over medium flame. Sauté the onions and garlic until the onions are soft and translucent, 5 to 10 minutes. Stir in the raisins, cinnamon, coriander, and cloves. Remove from heat. Whir the sesame seeds in a dry blender. Drain the chiles, reserving the soaking liquid. Add the chiles to the blender along with the tomatoes, vegetable broth, and ½ cup of the soaking liquid. Blend until you have a smooth puree. Wipe out the skillet. Heat the remaining tablespoon of oil over medium flame. Carefully stir in the pureed chile onion mixture. (Mixture will spatter.) Stir in the apple juice and salt and bring to a simmer. Stir in the almond and peanut butters, the chocolate, and the maple syrup, whisking until the chocolate melts. Simmer about 5 minutes. 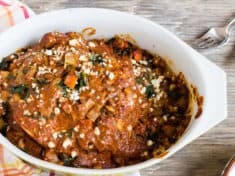 The mole sauce should be slightly sweet and the consistency of heavy cream. If it seems too thick, whisk in a bit more vegetable broth or chile soaking liquid. Season to taste with salt.